Another game of IABSM dating back to 2012, the main aim of which is to further explore how the rules work. No scenario: just some terrain laid out on the tabletop, a couple of armies and off we go. Strategus Maximus and Burt play the Soviets, Fasbender and Daemon play the Germans...and, for the first time, we are introducing the IABSM concept of Blinds. Objectives: The Germans must capture a bombed out town, the Russians must stop them doing so. As soon as the game starts, Soviet aviation begins to punish the German armor. And where Soviet armor was supposed to have been, Soviet motorized artillery appears instead: and proves very effective as panzerjaegers. It all looked as if the speed of the German advance was going to quickly end the game in their favour, but an unfortunate die roll reversed the situation and, from here on, it was an easy battle for the Soviets, and a hard slog for the Germans. The German advance constantly bumped up against hidden Soviet units, and those that they did pre-spot were exactly what they didn't want to find: Soviet anti-tank guns and artillery! Although it was getting more complicated for the Germans, especially with their dodgy dice rolling, the game was not yet decided, but it really did now look as if they were going to have some difficulties in achieving their objective, especially with the Soviet mobile artillery firing away and holding their positions like lions despite taking extreme punishment! When the Germans managed to cross the river, which had become their own personal Calvary, they realised that they still had some chance of achieving their goal...provided the dice didn't keep rolling against them. Given the line of Soviet anti-tank guns in front of them, the Germans then decided on an infantry assault. Meanwhile, behind a hill, a company of Soviet T-34 tanks was spotted by the Germans. These they could not budge from their strategically important position, although they did do them some damage. The T-34s, ignoring what the Germans are doing to them, decided to continue with their commander's plan: part of them would attack the Germans approaching them from the other side of the hill in order to delay them for long enough for the others to retreat. 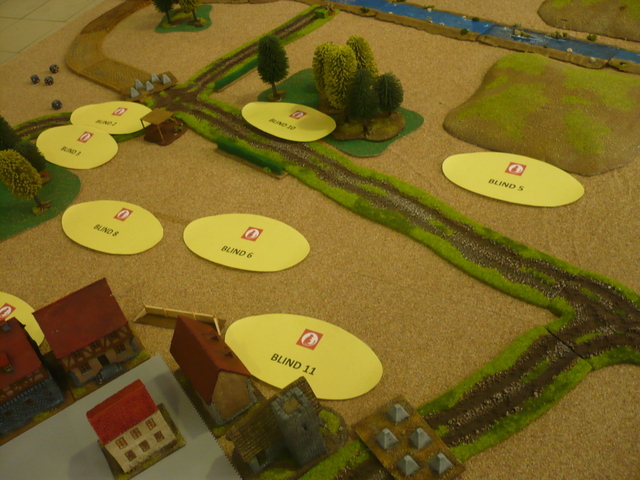 Meanwhile, in the town, the Russian infantry moved into their defensive positions, just before the Tigers started to appear outside the village. Soviet aircraft, however, aware of the damage they've been able to do to Germans tanks earlier in the day, attacked the Tigers, managing to inflict enough casualties to make the German tanks begin to rethink their attack. On top of this, the T-34s, retreating as planned toward the village, hunted down the rest of the Tiger unit, catching them off guard. In the end, the only Tiger that remained intact headed for the entrance to the village, more to protect itself from the Soviet aircraft and T-34s than with the aim of taking the town, and found itself assaulted and destroyed by Soviet infantry. The T-34's, on the other hand, although they've taken heavy casualties, are still following orders and ready for the fight. The T-34 that have gone to meet the troops on the other side of the hill, are also received "with love and affection" by advancing German tanks. Meanwhile, the German mechanized infantry, seeing that the Soviet mobile artillery are Pinned from repeated impacts, manage to surround them. Suddenly, however, one of the armored transports jumps in the air, with troops inside included: an IS-2 unit appears from behind the forest, hitting the undefended flank of the half-tracks. Meanwhile, the German infantry assault on the anti-tank gun battery has still not yet been fully resolved. Each side has lost about half their men, and one Soviet gun crew has limbered up in order to retreat. Meanwhile, the infantry in the village had barricaded every position in preparation for the German assault. Although we would have liked to continue, at that point we ran out of time and had to stop. The first was an advance without too much opposition. The third was a resurgence of confidence and a new breakthrough. And the fourth was the advance halted as they ran into unexpected Soviet units. The Germans really did very badly in the game, especially considering that the bulk of their troops didn't even manage to cross the river, and were effectively held up by small units of Soviet antitank artillery and a few T-34s. In the end, although it was very clear that the Germans weren't in a very good position, we agreed on a draw, especially as much of the poor German performance could be blamed on the dice! Burt Minorrot, with some of the images by VIIII Legion.